Later on, we began to understand that he liked the security the hood gave him due to Sensory Processing Disorder. But the truth is, kids often get addicted to a piece of clothing for what seems as no reason at all. What piece of clothing is your child particularly attached to? A red hooded sweatshirt, perhaps? My son tends to wear whatever San Jose Shark hoodie I get him at Xmas and he is a junior in high school. My three-year-old as a set of pajamas that he always wants to wear. They are blue with a puppy on the front. He calls them his “puppy-dog pj’s,” and he wears them every single night to bed. The rest of my kids aren’t attached to a particular article of clothing. Having a favorite article of clothing is pretty normal for kids and they usually outgrow this. My daughter has a rainbowy zebra striped hoodie jacket that she loves. The stripes are actually black, but the background is rainbowy. It is quite….bright. I have a least a million pictures of her wearing it. It actually sounds adorable… then again, I don’t have to look at it every single day. Ha! She’ll probably look back at all those photos and love seeing it. All my kids have done this – and worn that piece of clothing to threads. Of course to be honest, I do it too 🙂 The shirt or hoodie or whatever just gets so soft and feels so familiar and fits *just right*. I know what you mean…. I have a favorite pair of sweats for lounging around in that have given up the ghost but I just can’t seem to give them up. Bahah. The first line/question of your post made me laugh out loud. I guess because I was wondering the same thing recently. My 2 year old girl is obsessed with her “Dora” pajama shirt with sequins. It’s hideous. We only own it because Grandma gave it to her, but I sure do despise Dora. I think this is adorable. My cousin, Missy used to be attached to a blankie and she called it her silky. It was those stupid blankets that everyone had it they were made of usually ugly colors, like my grandma had one of the ugly yellow ones maybe even from the 70’s. Missy’s was blue. I remember they had the tendency to pill/get little fabric balls on them. In any case I did not hold them in high regard. I think I was around 11? Anyway, my aunt and uncle brought her over and she had a conniption fit since they forgot to bring the silky. So I had to find the before mentioned ugly yellow one. Which she still wasn’t happy about and we had to calm her down, through tears? IDK. Anyway, she would put the “silky” edge against her nose and fall asleep. My brother would wear certain clothes until they did not fit anymore and then still try to wear them. He had a blue Hawaiian shirt and a camouflage. shirt that my mom made for him that he wore, even when they were too small. Your comment gave me a flashback! I remember visiting my grandmother and she had Winnie the Pooh yellow wool blankets with satin lining that we just loved. They were only at her house but they definitely gave us comfort. For my son, it’s the hoodie from the most recent hockey tournament. I have a hard time getting it off him to wash it! Perhaps the hoodie will eventually walk off your kiddo and drop itself into the washer? Ha! Oh, he’s so cute in that sweatshirt! 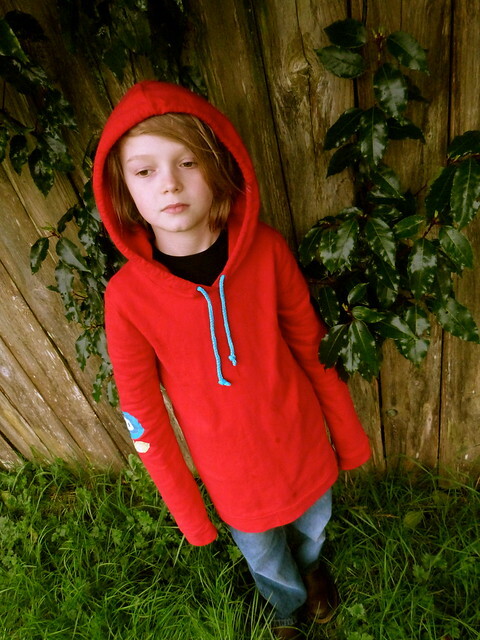 My son does the exact same thing with hoodies – he loves them.